Leave your comment to the sweatshirt here > CLICK CLICK!, you will have bigger chance to win! 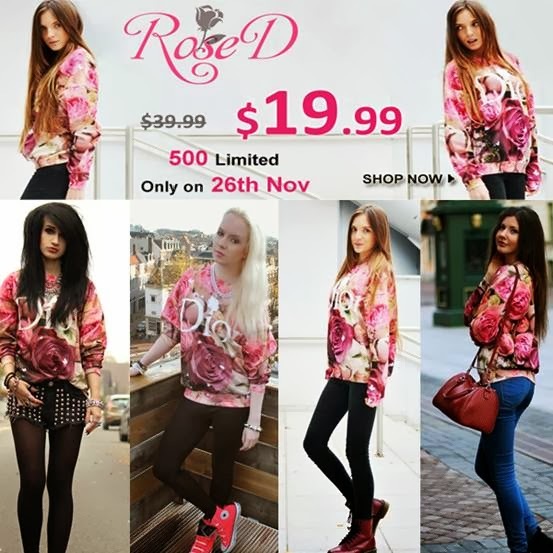 Romwe “Rose D” flash sale, only 24 hours! $19.99 only, with original price $39.99, on 26th November! 500 pieces, but size M is only 200 pieces! 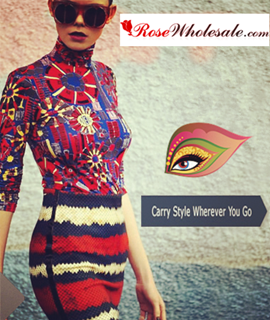 4507 customers have already added “Rose D” to their shopping bag, so adding it into your shopping bag in advance, and then you can pay directly when it begins just in case it's sold out. Thanks for the note. Really, a lovely blog! Great photos! super zdjęcia utrzymane w fajnym klimacie! I love the photos! So good! Skirt and coat are perfect! Love this environment for the photos and your outfit reminds me of Little Red Riding Hood!! I'm following you here on GFC and on Facebook! very pretty! I love your lovely top! Cudny outfit, a foty takie nastrojowe - czad!! 1 zdjęcie - Monika Brodka! Love the color burgundy!! I also love your entire outfit :D this is my favorite season to bust out my leather skirt :] You also have the most amazing hair! I have so much trouble managing my curls that I blow dry and straighten them out. Love yours though!! Nice pictures, I love the shoes! burgund + czerń - uwielbiam ! great look!...you look lovely, and I'm loving the title on this post, I think I'm gonna use it as inspiration for my next illustration, take care! Kocham ten płaszcz! Wyglądasz w nim świetnie. Spódnica też bardzo mi się podoba - zazdroszczę zawsze wszystkim kobietom, które w spódnicach wyglądają po prostu kobieco. Znowu zachwycam się Twoimi zdjęciami - piękne są! Wow, świetna stylizacja ! Każdy nowy post coraz to ciekawszy. O rany, jaki cudowny klimat tu u Ciebie! <3 Piękna! I am a huge fan of burgundy colour for Fall as well! Such a warm colour.x I absolutely love your outfit sweetie, so stylish! Gorgeous heels and coat! So pretty. Najbardziej podoba mi się płaszczyk :) Czerń z czerwienią to świetne zestawienie! You look super fab. I love your heels and leather skirt. ciepły sweter i skórzana spódnica super razem wyglądają! Przed świętami od razu bierze mnie na czerwony kolor. Jednak marketing jest wielki! Wyglądasz apetycznie. Gorgeous look, dear. love the layering. Gorgeous outfit. Love your shoes hun. Thanks for comment on my blog! I follow you since now. I love your shoes, are amazing!! kisses. Such a beautiful post! And those heels are fierce! Mi się marzą burgundowe spodnie, jednak jeszcze nie trafiłam na odpowiedni model ;< Świetnie wyglądasz. Zdjęcia mają fjany klimat. I love so much this photos omg!!!! really i do!!! new follower, follow me back? Hi Berries this is a beautiful outfit! Thanks for stopping by my blog. I tried finding your fb page, but the link you left on my blog is not the right one. Twój sweterek na wspaniały kolor czerwonego wina!! pozdrawiam Cię a bloga dodaję do ulubionych! Great outfit! And what a beautiful place too! Just found your blog and really like your look! Would you like to follow each other on GFC and bloglovin to stay in touch? Let me know! Much love from France, Jane. Piękna pogoda u Ciebie i oczywiście pięknie wyglądasz ! Hey there! Thanks for the comment!! We can also follow each other on GFC and bloglovin if you like. Love the skirt and the shoes, you look so pretty! i Loved the sweater a pretty detail the collar ... I love the leather skirts, a beautiful look! ... Hey, I put on your facebook like!, I have not, but I'd like us to follow each other from GFC, if you're agree to follow me, inmediately i follow you back ... Greetings!. Amazing look. Love the red sweater and the heels. Great picture and outfit dear! love our outfit and the pictures are great! I love your red sweater and Choies coat.Great photographs! Pretty skirt and red looks really amazing on you!